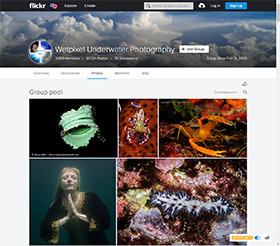 Sample photos from the Canon D30 Digital SLR taken by professional underwater photographer Jim Watt. Join professional underwater photographer Jim Watt and a group of amateur underwater photographers aboard the Kona Aggressor II! Feature includes daily updates from Eric Cheng. Exclusive photos of digital camera equipment at the Dive Equipment Manufacturers Association Expo, January 2001, New Orleans LA, USA. Exclusive photos of digital camera equipment at the SCUBA 2000 Expo, June 2000, Long Beach CA, USA. David Breitigam's first feature where he tries his best to sell you on the idea of underwater digital photography. Did it work? MCD / Arrow's aluminum housing for the Agfa ePhoto 1280 / 1680 Digital Camera. Exclusive photos of digital camera equipment at the Dive Equipment Manufacturers Association Expo, January 2000, Las Vegas NV, USA.